Pat Sloan designer, author, lecturer, and with her weekly radio show... Pat truly is the "Voice of Quilting". She has a deep passion for making quilting fun for herself and everyone around her. Pat loves to hang out with quilters on the internet as well as visit you in person. Be inspired to get more done! Sewing since she was a child and quilting for over 20 years, Pat eventually looked to her craft as a business. After a few years quilting she started to teach quilt making to others and then turned her skills to pattern designing. She found that she really enjoys designing and seeing how other quilters made her patterns. In 2000 Pat's designs became so popular that she and her husband Gregg formed a design and publishing company called Pat Sloan & Co. In addition to designing and publishing her work, they now travel around the country teaching and showing her quilts to quilt guilds and quilt shops. Also, Pat has had her designs published in all the national magazines, she has written 31 quilt books and has designed many lines of fabric for Moda Fabrics. When Pat took her passion to the internet she built several quilt communities, the largest is her group on Facebook with over 41,000 quilters from around the world. 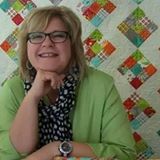 Over Five years ago she started a weekly All Quilting radio/podcast. You can hear her interview quilt celebrities, historians, designers and authors from around the world, all on your computer! All the podcasts are available for download. Visit her website www.patsloan.com to see all the Pat Sloan & Co. patterns.